In a previous post, I outlined some key similarities and differences between thecurrent housing crises in Ireland and Spain. Many of the underlying economic and socio-demographic structural factors would indeed appear to be striking similar in both countries. A recent paper by Professor Juan Romero (Inter-university Institute for Local Development and Department of Geography, University of Valencia) and co-authors published in Environment and Planning: C, provides further insights from a new institutionalist political science perspective into the governance failures leading to the speculative property bubble and subsequent crash in Spain. The authors highlight the importance of ‘informal rules’ in institutional processes related to land management and spatial plannning. Following Ostrom (1998) they refer to a ‘second order collective action dilemma’, where shared expectations of foul play on the part of other actors, influences the behaviour of rational actors to the extent that each individual has something to gain from acting corruptly or turning a blind eye to certain practices. Clear parallels to the Irish case, are of course, evident here. More concretely, the authors note that the official designation of land as ‘fit for development’ through formal planning processes had immeadiate economic as well as legal implications for the landowners and local and regional property markets. Again the parallels to the Irish case, where specualtion over land-use zoning led to serious corruption are strikingly clear. In both cases, the politics of planning and urban development has been significantly influenced by soft institutional factors which have undermined the capacity for land management processes to effectively serve the public interest. Academic and policy debates on the causes and consequences of the current economic crisis need to consider the soft institutional aspects which have contributed to serious governance failure in land management at local regional and national scales in Europe. The search for and development of new approaches to sustainable land management furthermore requires a critical, comparative evaluation of the faiures of exsiting governance models. These cases can often prove as insightful as cases of good or best practice! Commentary on the current housing crisis in Ireland has placed significant emphasis on what are often perceived as peculiarly Irish problems of clientelism, cronyism, localism and poor regulation leading to the overextension and subsequent collapse of the property market and a massive oversupply of housing. Comparison with the parallel experience of overinflated housing markets and subsequent collapse in Spain may in this context prove insightful. 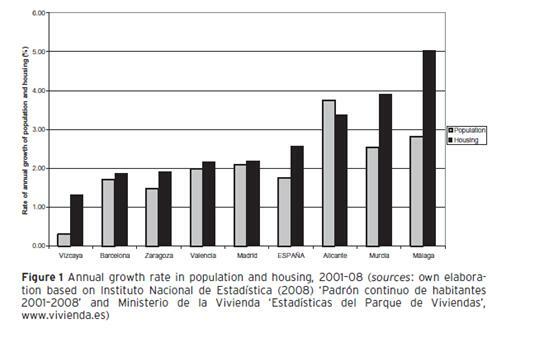 The bullet-points summary below is adapted from an article in the International Journal of Urban and Regional Research published in December 2010– Garcia, M. (2010) The Breakdown of the Spanish Urban Growth Model: Social and Territorial Effects of the Global Crisis. While there are striking similarities, there are key differences in the response to the crisis by government and the banking sector. In particular, Spanish banks have taken an active role in the property market, selling houses at discounted prices and developed innovative mechanisms to restructure the mortgage debt of households whose employment circumstances have deteriorated. It would appear that there is significant potential for cross-national learning between Ireland and Spain, both in terms of disentangling local, European and global causal factors (in as much as this is possible or useful) and in terms of coming up with solutions and ways forward. We cannot fully understand post-crisis Ireland without an appreciation of similar experiences elsewhere.